Home Page | Archive by category "Fashion"
It can be intimidating to venture out onto the weight room floor, especially when it’s full of bodybuilding types throwing weights around. But you aren’t doing yourself any favors by staying in the corner with those little pink dumbbells! “You have two types of muscle fibers: slow and fast. If you don’t use heavier weights, you neglect an entire set of muscle fibers, namely the fast fibers, which are important for moving quickly, lifting weighty objects (your heavy purse, grocery bag, suitcase), and for spine and hip stability,” says Michele Olson, Ph.D., professor of exercise science at Auburn University Montgomery and creator of the Perfect Legs, Glutes & Abs DVD. 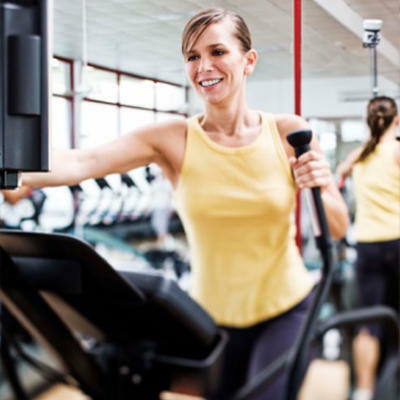 Olson recommends using machines with an upper body component, like a total-body elliptical machine, and alternating intervals focusing on your upper and lower body. For example, try pumping the handles more aggressively with your arms for 2 minutes, and then focus on moving with your legs for the next 3 minutes. Or mix things up by using an upper-body arm bike (or try a Krankcycling class) that forces you to raise your heart rate using only your upper half—it’s tougher than it sounds! 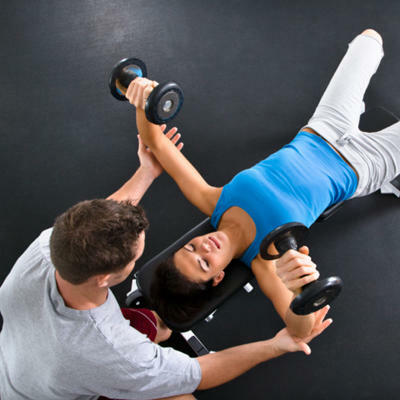 Your primary objective (weight loss, endurance, strength) should influence the volume (amount you do), intensity (how light or hard/heavy) and the mode (cardio, resistance exercises, stretching programs) of every workout, which is why Olson says it’s so important to take the time to meet with a qualified trainer at your gym for an assessment and to help create your goal-specific program. You may have just spent 2 hours at the gym, but how much of that time were you intensely exercising? Yes, fitness should be fun, but if your set routine involves reading a magazine on a card machine followed by the same weight machine circuit, chances are you aren’t seeing the results you want. This is especially important if your goal is weight loss. If you’re trying to lose weight, what you eat is incredibly important, especially if you’re regularly exercising. 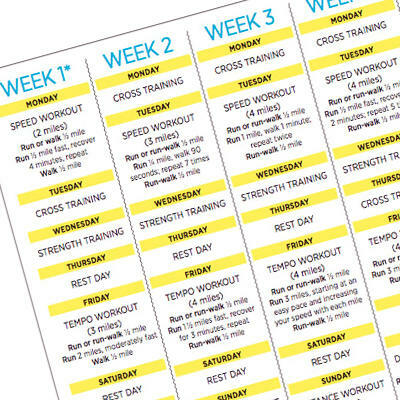 “A trained expert can speed up your progress and results as well as prevent you from burning out, under-eating, or over-doing,” Olsen says. We like to work the muscles we can see in the mirror (like our abs), but we can’t ignore our backsides, especially the muscles around our spine, Olson says. For example, we tend to crunch, curl, and shorten our abs, but it’s also important to try some eccentric movements to help balance out the strength of those muscles during “lengthening” movements. Rotating Super Girl:This move uses a ‘sit-up’ board (or bench) adjusted on a decline. Start sitting on the bench and hook your legs under the pads to hold them in place. Keeping your abs drawn in tight and your spine straight, hinge back away from your legs until your body is making a ‘V’ shape. Bring both arms up and bend your elbows, turning your palms in as if you were holding a giant ball above your head. Slowly rotate your torso to the right (as shown), then back to the center, and to the left (counting each rotation as one rep). Work your way up to three full sets of 15 reps to target your abs in a whole new way. You already know that it’s important to do weight-bearing exercise to help protect your bones, but you may not realize just how much loading you need to do in order to reap the bone density benefits. 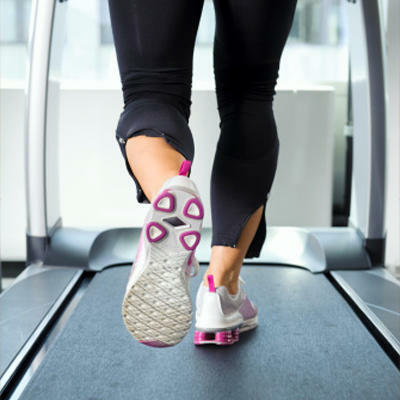 “While treadmill walking is sufficient to keep the spinal bones strong, your hip bones need more loading,” Olson says. 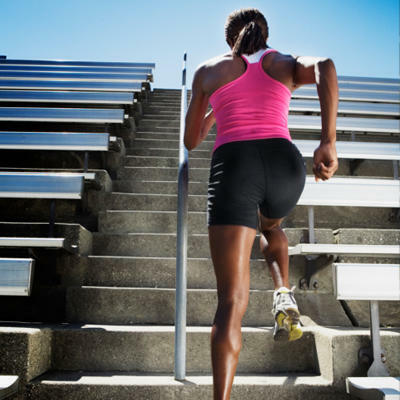 “To do this, think “steep,” or “stomp.” If you want to stick to walking, increase the incline on the treadmill to seven percent for 3 minutes, followed by 5 minutes on level ground, alternating five times during a 40-minute workout. Other options: Take a step class, use that machine with the revolving stairs, or walk the stairs in your gym. This extra impact is not too heavy but at a level that is much more effective at getting your hip bones to take up more calcium and become more dense. Every time you use a leg press, leg curl, or leg extension machine at the gym, you work both legs together at same the time. The problem? This could be causing some muscular imbalances in your body, according to Olson. “Most of us do not have equal muscle fitness on our right versus left leg, and when you exercise both legs together, the stronger one tends to naturally do a bit more of the work,” she says. 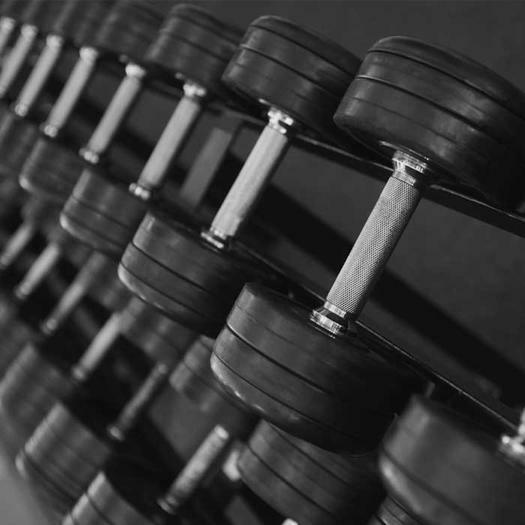 Try using less weight and doing a full set on your weaker (usually the left) side first. Then, switch legs and do a full set with your stronger side. “It’s a real eye-opener—try it! Training like this will also go far to help you balance the strength between the right and left sides of you body,” Olson says. Skipping a post-workout stretch is the most common mistake exercisers make, Olson says. After, not before, your workout is the perfect time to stretch, as your muscles are warm and flowing with oxygen-rich blood. All adults should be stretching at least three times a week, Olson says. Stretch the front side of your body first, since tighter muscles on the front of the body can reduce flexibility in the back of your body. For example, if your hip flexors are tight, your hamstrings will have limited flexibility. Heel to Glute Stretch (top image): Lie facedown on a mat or towel with your legs extended out behind you. Reach your right arm out in front of your shoulder, palm pressed into the floor. Bend your left knee and grab a hold of your left foot with your left hand, gently pulling your heel in towards your body. Hold for 30 to 60 seconds and then switch legs. If you have time, repeat up to three times total with each leg. Prone Abs Stretch (bottom image):Lie facedown with your legs extended out behind you, bend your elbows in underneath your shoulders and lift your chest off the floor, propping your body up with your forearms (palms should face the floor). Let your lower body relax and try to keep your hips on the ground as you extend your spine and stretch the front of your body. Hold for 30-60 seconds and then release. If you have time, repeat up to three times total. Changing your direction is another great way to mix up your cardio workouts for better results. If you always move forward on the treadmill, elliptical, or bike, try moving sideways and backwards too, Olson says. Try this routine: Walk or jog for 3 minutes forward, and then turn to the side and do a side shuffle for 30 seconds with your right leg leading, and then turn around and lead with your left leg for 30 seconds. Return to your forward stride for 3 more minutes, and then try walking backwards for 30 seconds. For safety, be sure to slow your speed and/or use the handrails as you adjust to moving in new directions. “Since your body is not used to this (even though it is designed to move in all three directions), it will pump your heart rate up higher and cause you to burn extra calories.” You can also do this on the elliptical or stationary bike. Use the interval routine above but simply pedal backwards for the 30-second intervals. Our bank holiday sports wear and gym wear sale is nearly over… hope everyone has had a great bank holiday. New Products Available Online Now…..